Meika is a very sweet girl who needs a special person to call her own, meika can get a little stressed in busy environments so needs a quiet home where she can spend her best years. Meika is spayed, microchipped and vaccinated. 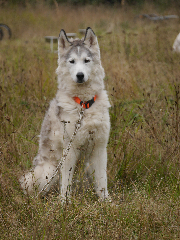 There is no adoption donation for Meika but all potential homes will be subject to a home check. Loki is desperatley looking for his forever home. He is currently being boarded in kennels so urgently needs his forever home. Loki is an affectionate 1 year old male. He is good with other dogs and would benifit from going to a home that has an established pack or one or two stable dogs. Loki is used to living with children. Loki knows some general obedience including sit and paw and he is also crate trained. Loki has shown some promise in harness but has recently been castrated so his harness training has been on hold. If you could offer Loki his forever home please get in touch. Loki is castrated, microchipped, and fully vaccinated. Adoption donation £200. Location Banbury, Oxfordshire. Kee is an energetic young male who loves life, Kee is good with other dogs. 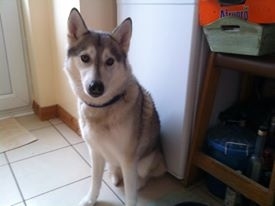 Kee would be able to live with a well balanced male or female or as a single dog with someone around most of the time. Kee has worked in harness mainly in a two dog team and has shown lots of potential. Kee would love his new home to be an active one and not necessarily a working home but one that he could enjoy lots of long walks on with his new family. Adoption donation for Kee is £200. If you think you could offer Kee his forever home please get in touch.